Voltaire? Peter Gay? William F. Bottiglia? Apocryphal? 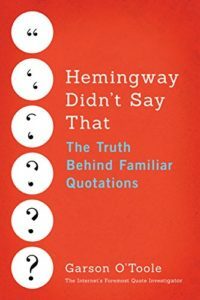 Dear Quote Investigator: Many dubious quotations have been ascribed to the preeminent French satirist and philosopher Voltaire. One popular saying depicts life as a metaphorical shipwreck. The survivors are exhorted to sing while sitting in the lifeboats. Is this saccharine guidance really from the acrid pen of Voltaire? I have also seen the words credited to a fictional character named Bottiglia. Does that ascription make sense? Comptez que le monde est un grand naufrage, et que la devise des hommes est, sauve qui peut. Voltaire’s remark did not mention lifeboats or singing; thus, his tone was quite different. Indeed, Voltaire preached—by example rather than by precept—that the recognition of the truth that this world is filled with evils leads to a certain good humor. If this life is a desert, it is our duty to make an oasis in it; if this life is a shipwreck, we must rescue as many as we can, and not forget to sing in the lifeboats. This, I think, is the message of Candide; its continuing popularity rests not only on its wit, its pace, its color, but also on its enduring relevance. Here, in that concluding sentence of the tale, Voltaire has fused the lessons of ancient philosophy into a prescription: Men are thrown into the world to suffer and to dominate their suffering. Life is a shipwreck, but we must not forget to sing in the lifeboats; life is a desert, but we can transform our corner into a garden. 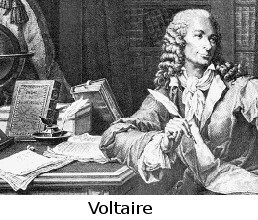 Thus, the quotation under examination was crafted by Peter Gay who was presenting his interpretation of the central thesis of Voltaire’s story “Candide”. The misattribution illustrates a known error mechanism. Person A summarizes, condenses, or restates the opinion of person B. At a later time the restatement is directly ascribed to person B. Posted on April 22, 2018 May 2, 2018 Categories VoltaireTags Peter Gay, Voltaire, William F. Bottiglia? Winston Churchill? Voltaire? Julian Amery? Ronald Reagan? Apocryphal? Dear Quote Investigator: According to legend a political rival of Winston Churchill was once praised with the description “He is a modest man.” Churchill responded with the quip “He has much to be modest about.” Would you please investigate this tale? The originator of the barb was unidentified although the prefatory words suggested that the critic wished to see more reforms from Attlee’s administration whereas Churchill opposed those reforms. The phrasing of the remark has been variable, and an instance was ascribed to Churchill by April 1947 in a Canadian newspaper. Voltaire? William Ralph Inge? Herbert Paul? Paul Chatfield? Horace Smith? Katharine Fullerton Gerould? Anonymous? And, after all, what is originality? It is merely undetected plagiarism. The saying has a long history and important precursors were in circulation in the 1700s and 1800s as illustrated below.